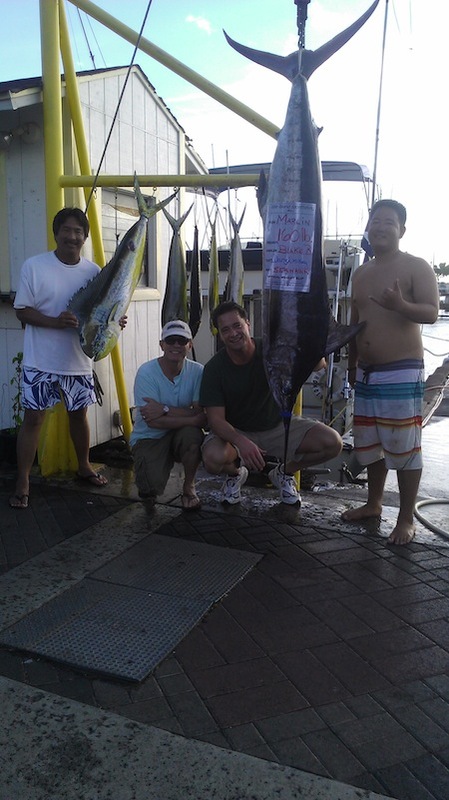 Mahalo to Blake and Donald for choosing Maggie Joe Sport Fishing and sharing these great photos! 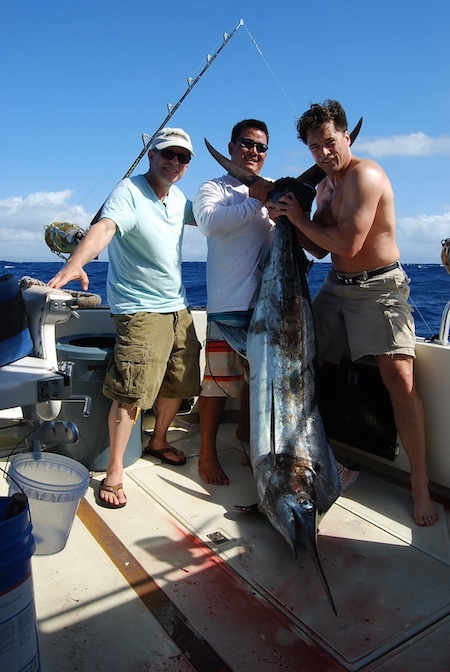 They spent the day deep sea fishing outside of Honolulu, Hawaii with Captain Darryl and Mate Mikey! Here’s what they had to say… Aloha! Captain Mike – Sorry we missed you but we really enjoyed fishing with Darryl Chow and Mike Sunada! Having fished with you in 2001, I had hoped to go out with you on the Maggie Joe again. Alas, my new favorite boat and crew is the Sea Hawk and her crew of Darryl & Mikey. Perhaps the attached pictures will allow you to forgive me! Posted in Deep Sea Fishing, Gallery, News | Comments Off on Customer Photo! If you’ve been wondering where we are…. here we are! 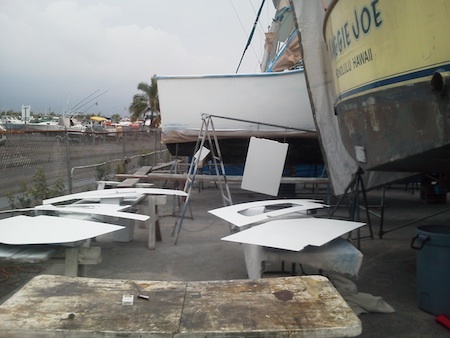 The Maggie Joe and Ruckus is on the way to their annual dry dock in Kona! 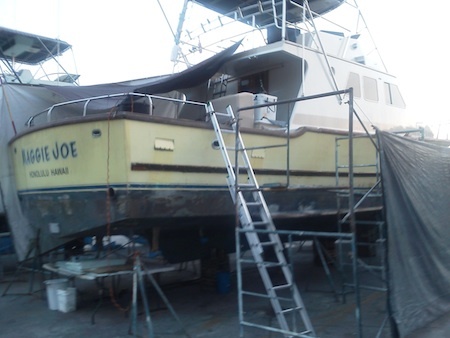 The Maggie Joe and Ruckus will be in Kona for dry dock a quick 3 week face lift. 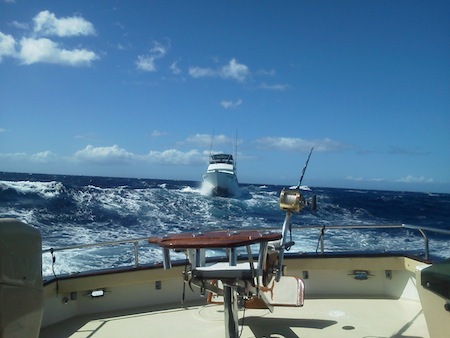 In the mean time, the Sea Hawk is still on Oahu and fishing. This is the view from Maggie Joe looking back on the Ruckus. 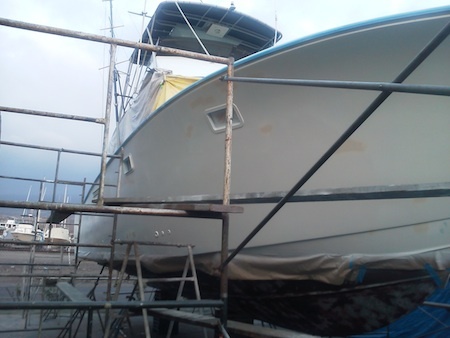 Keep checking out the blog for updates from dry dock and fishing reports from the Sea Hawk! Aloha! Paul and Phil with catch! 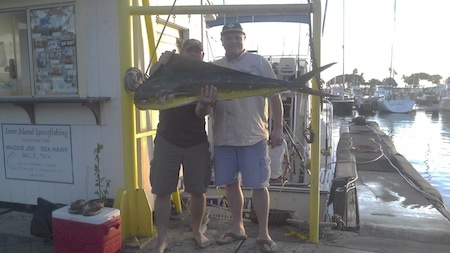 Mahalo to Paul and Phil for choosing Maggie Joe Sport Fishing! The guys joined Captain Matt aboard the Ruckus on a sport fishing charter. 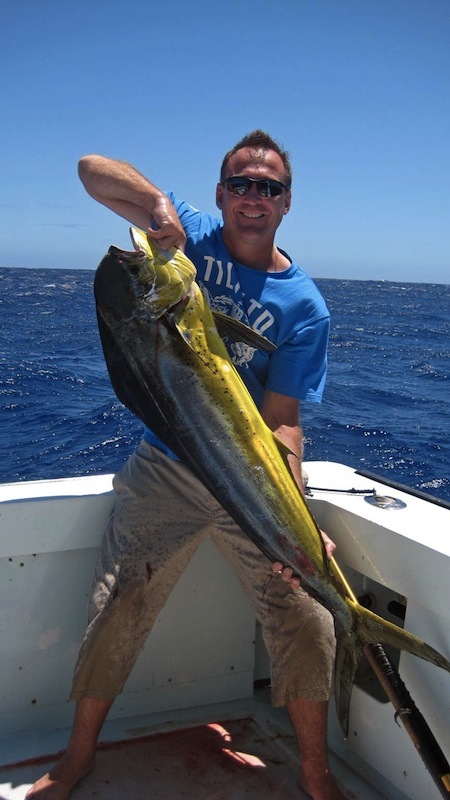 While deep sea fishing outside of Honolulu, Oahu they brought in 2 tasty Mahi Mahi! Aloha! 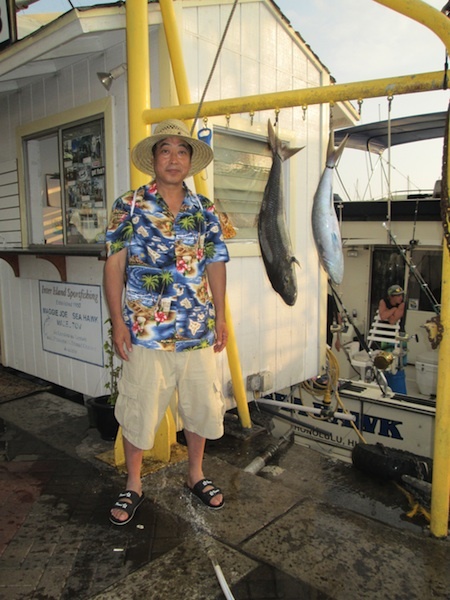 Mahalo to Ronald for choosing Maggie Joe Sport Fishing! 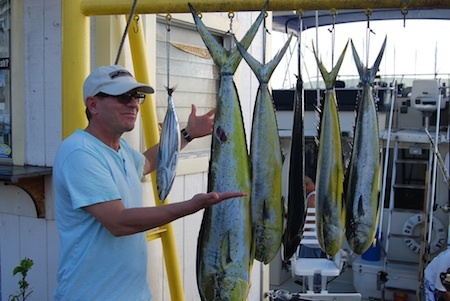 Ronald joined Captain Mark aboard the Maggie Joe on a sport fishing charter. 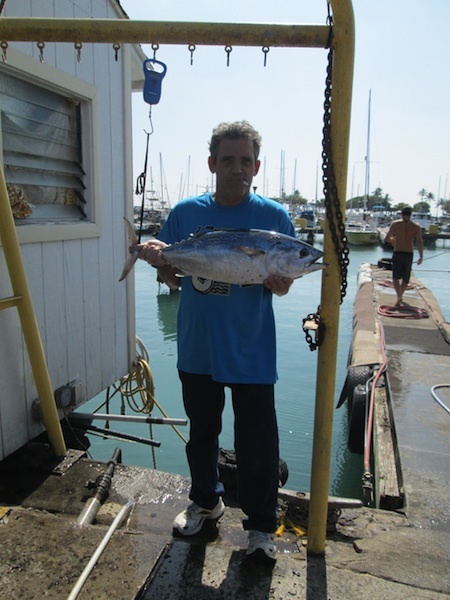 He brought in this tasty and nice sized Kawa Kawa while deep sea fishing outside of Honolulu, Oahu! Mahalo! Joe and Grant with their catch! 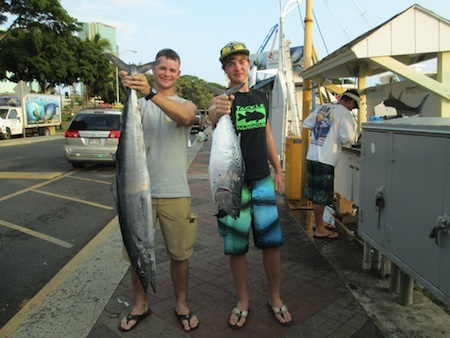 Mahalo to Joe and Grant for choosing Maggie Joe Sport Fishing! The guys joined Captain Darryl and Mate John aboard the Sea Hawk on a full day sport fishing charter. While deep sea fishing outside of Honolulu, Oahu they hauled in a nice Ono and Ulua! Hana Hou! Mahalo to Fusham for choosing Maggie Joe Sport Fishing! 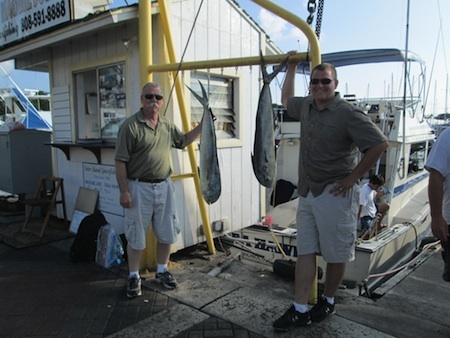 Fusham joined Captain Mike aboard the Maggie Joe on a sport fishing charter. He hauled in these two nice Ulua while deep sea fishing outside of Honolulu, Oahu! Aloha! Dave with his Mahi Mahi on the Ruckus! Big Mahalo to Dave for not only choosing Maggie Joe Sport Fishing but also for sending in this great photo from his sport fishing charter! Dave caught this Mahi Mahi and a boat full of other Mahi Mahi while deep sea fishing outside of Honolulu, Oahu aboard the Ruckus! Hana Hou!